Fritz is pictured here at the conclusion of FPB's gig in Geneva, NY on March 10th with event promoter, Gene McFadden, and his wife. Gabe strikes a serious pose at the Winnek Post #396 in Geneva, NY on March 10th. You ought to be able to tell that Rick is havin' fun in this photo, taken in Geneva, NY on March 10th. Tom and Fred are shown here playing a tune at FPB's gig in Geneva, NY on March 10, 2007. 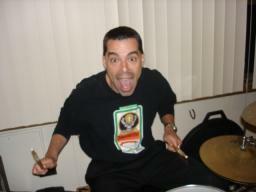 Rick clowns around with Ed Widomski (who sometimes is an FPB special guest drummer), on February 10, 2007 at the Utica Maenenchor. Tom meets the newest member of the FPB Fan Club, Jeffrey, during the FPB's gig on February 10th in Marcy, NY. 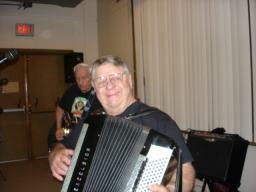 Rick and Fritz are shown here with FPB Fan Club Member, Charlie Miller, during "Fasching Night" on February 10th. FPB Fan Club Member, Betty Miller jammed with FPB on three tunes during the second set on February 10th. Like father, like son, Fred and Fritz rip through a tune on their Excelsiors on February 10, 2007 at the Utica Maennerchor in Marcy, NY. FPB jamming away at the Utica Maennerchor's "Fasching Night" bash on February 10th. Members of FPB are pictured cranking out a tune in Marcy, NY on February 10th. 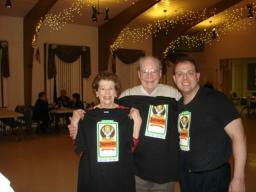 Frank, Fritz, and tom present new FPB fan, Donna, with an FPB/Jagermeister t-shirt after FPB's gig wrapped up on January 20, 2007. Frank is pictured here dancing with Donna, during FPB's gig at the St. Mary's Fundraiser in Waterloo, NY on January 20, 2007. Fritz with his Excelsior on January 20th in Waterloo, NY. 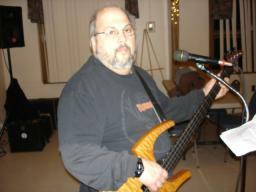 Gabe and Frank are pictured here at FPB's gig in Waterloo, NY on January 20, 2007.